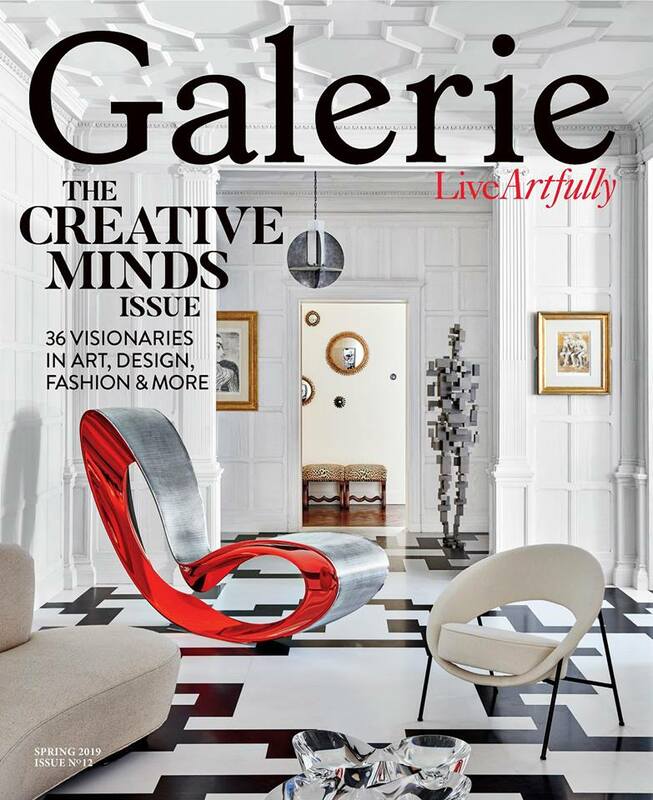 The narrow, hedgerow-lined country lanes of southwest England may not be the first place you’d look for one of the biggest blue-chip contemporary art galleries in the world. 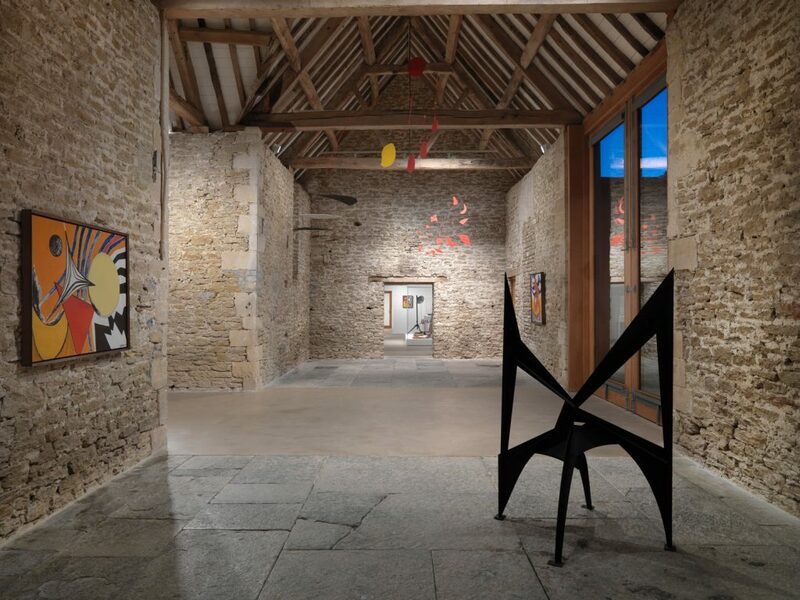 Nevertheless, that’s where you’ll find Hauser & Wirth Somerset, nestled on the grounds of the 18th-century Durslade Farm, which was in a state of disrepair after nearly a century of disuse before its cobbled buildings were transformed into a cutting-edge art center, complete with a gift shop and restaurant. Though the old barn doors may have been traded for minimalist glass windows, many of the structures still retain the charm of their pre–Industrial Age genesis, and the surrounding pastures continue to operate as a working farm where sheep and cows are raised. 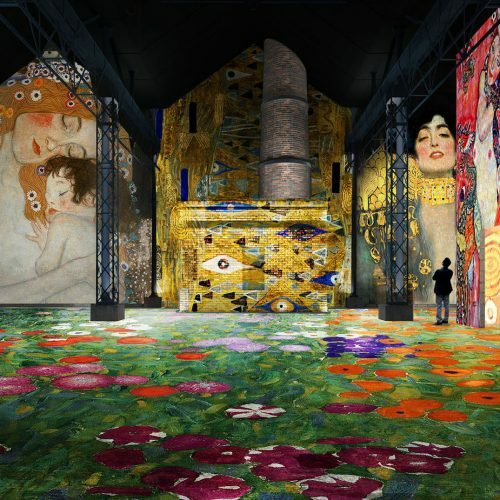 This bucolic location of the international gallery—which was started by powerhouse Swiss dealers Iwan and Manuela Wirth—is a multi-purpose exhibition space that has been serving up some of the biggest names in modern and contemporary art since 2014, and this summer’s show is no exception. 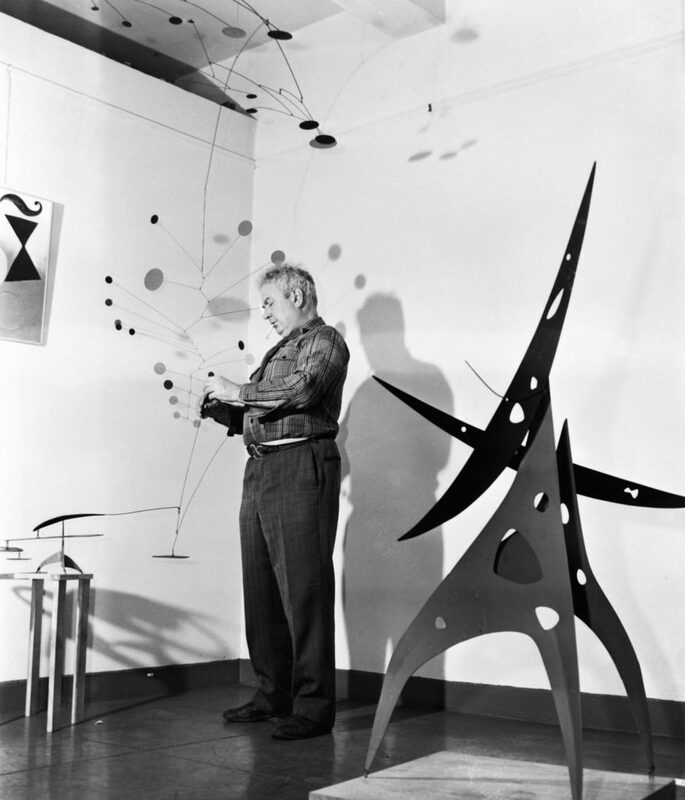 On view through September 9, “From the Stony River to the Sky” foregrounds the domestic life of pioneering 20th-century American sculptor Alexander Calder, who, like the Wirths, had a penchant for country living. 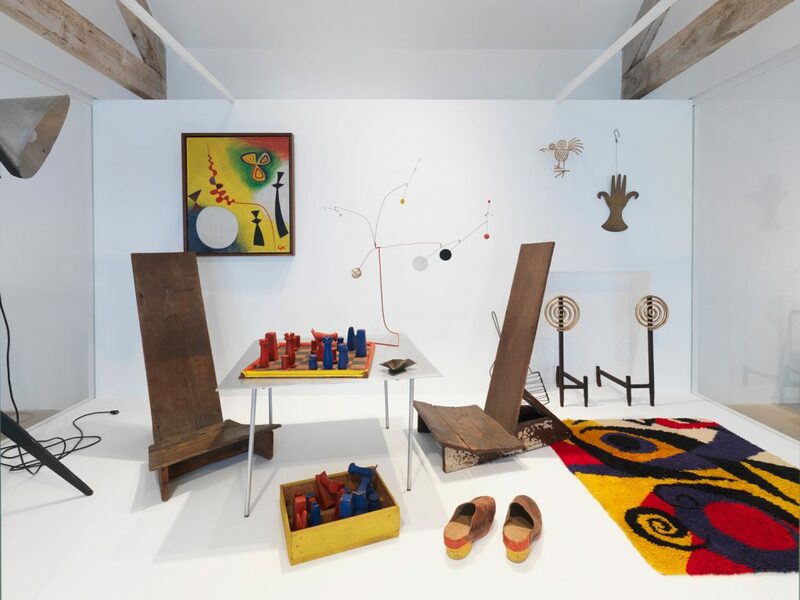 Through nearly 100 rarely seen designed objects, paintings, and sculptures installed in and around the stables-turned-galleries, the exhibition provides an intimate look at Calder’s creative experiments constructed from at his own farmhouse home and studio in rural Roxbury, Connecticut. 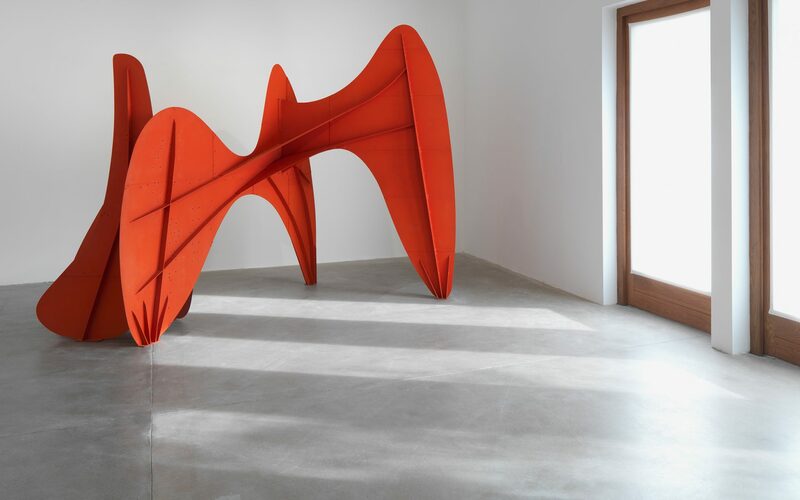 According to Dea Vanagan, director of Hauser & Wirth Somerset, Calder only started playing with sculpture on a large scale once he bought a dilapidated, 18-acre farm with his wife, Louisa, back in 1933. 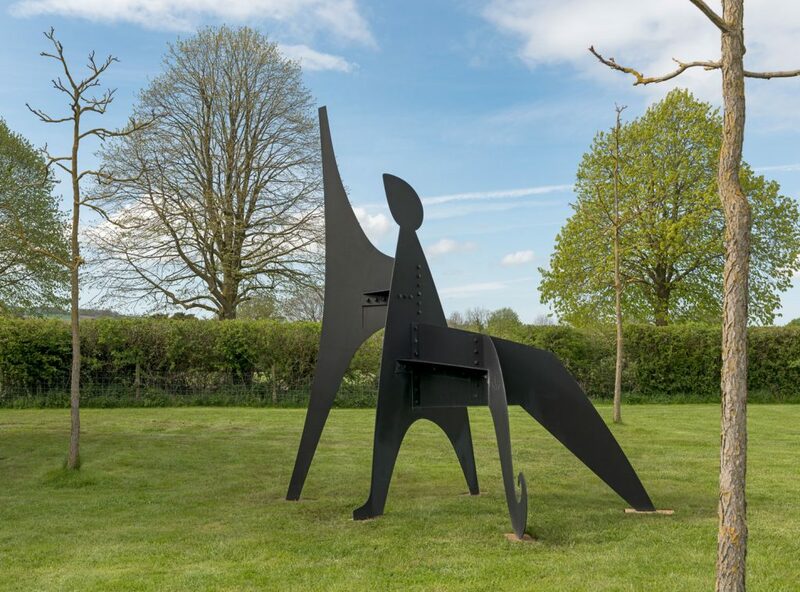 “It’s funny because his big, bold geometric public sculptures are iconic in so many cities all over the world, but he was inspired to work outdoors because he suddenly had all this space to do so,” she says. 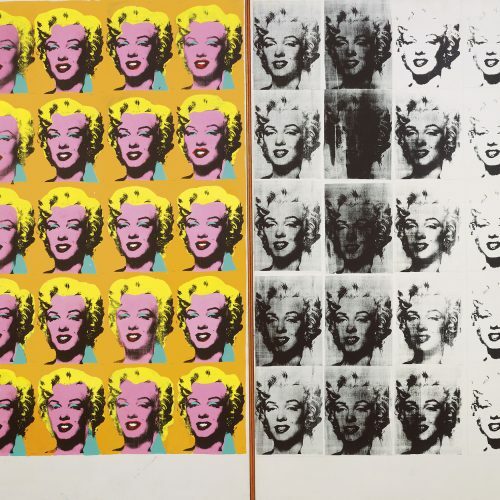 The show features some of the artist’s first flirtations with farm-inspired sculpture, such as one if his earliest outdoor works, Red, White, Black, and Brass (1934), and Apple Monster (1938), a surrealist biomorphic construction made from a fallen branch he found on in his property. 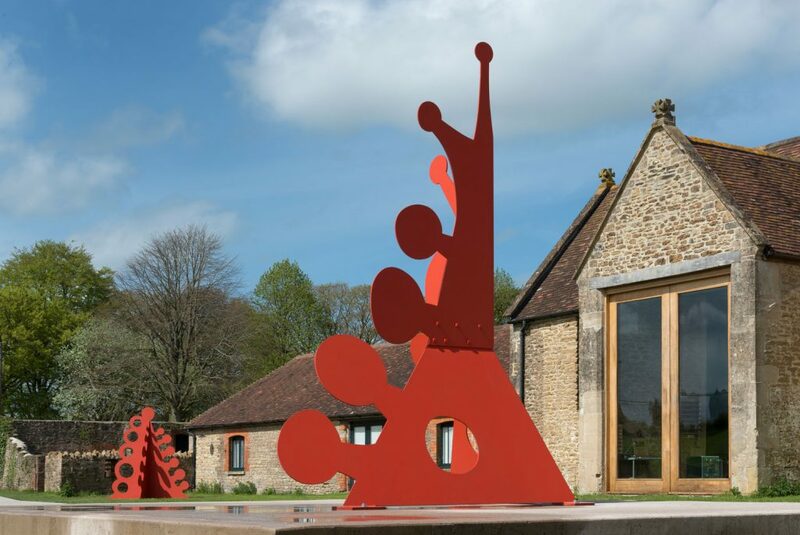 While these are on display inside Hauser & Wirth’s five former farm buildings-turned-galleries, several of Calder’s later—and larger—sculptures dot the grassy knolls around the Durslade compound, such as the bright red and tentacular Knobs (1976) adjacent to the center’s Cowshed entranceway, and the black and angular Polygons and Triangles (1963) in the sculpture court, once the farm’s piggery. 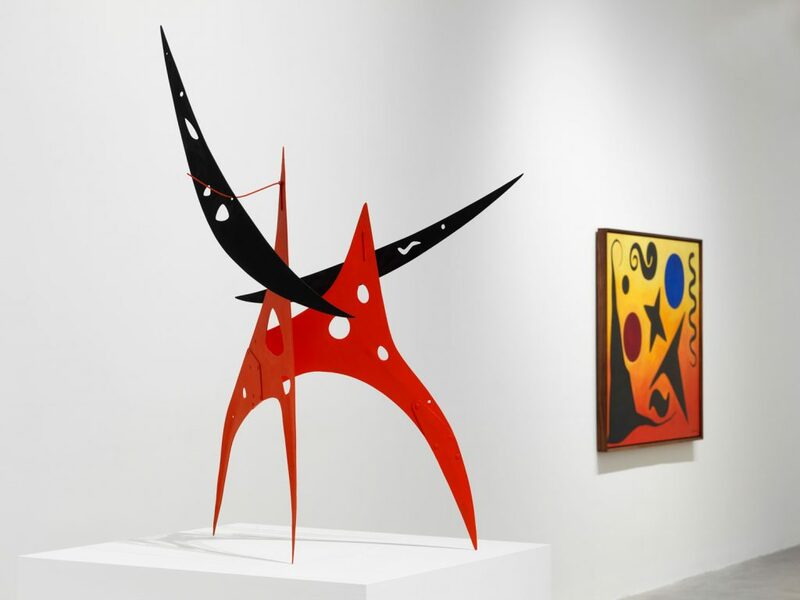 The most iconic “Calder” moments in the exhibition can be found in the Rhoades and Bourgeois galleries, where many of his kinetic mobiles and stabiles from the late 1940s to the mid ’60s—the invention of which dramatically altered contemporary art and design—are installed alongside some of his more vibrant and surrealist paintings from around the same time. 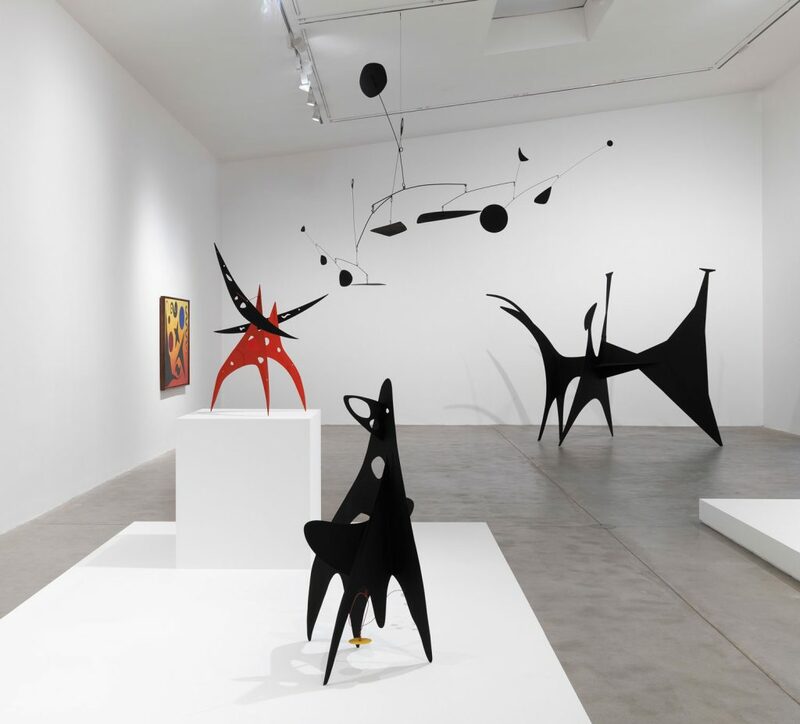 But where the artist’s ingenuity really shines is in the gallery that occupies the old farm workshop where, appropriately, many of Calder’s tinkerings made in his own Connecticut workshop are on display. 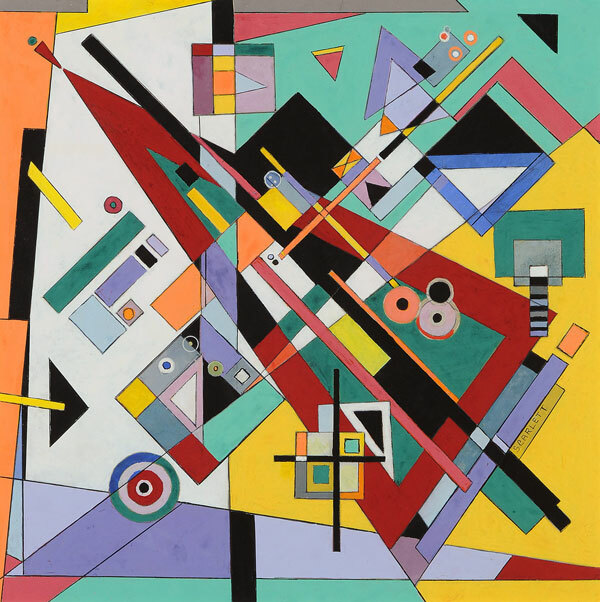 On loan from the Calder Foundation in New York, most of these have never been seen by the public. 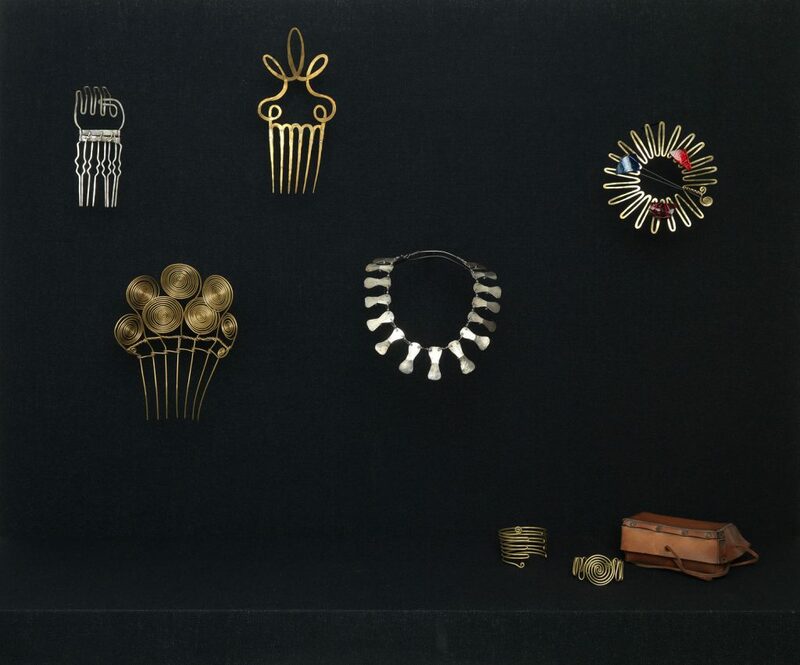 Here, visitors will find his artisanal jewelry designs to the everyday objects he made or amended for him and his family’s use, which encompass everything from a handwoven wool rug to a a chipped porcelain creamer he mended with a hand-wrought brass handle. A blue dinner bell made out of a broken Mexican wine glass that was used regularly at the Calders’ Roxbury home is one of the most requested personal items from the family’s collection to go on loan, while other bits and bobs are far more personal in nature—such as a toilet-paper holder made in the shape of hand. 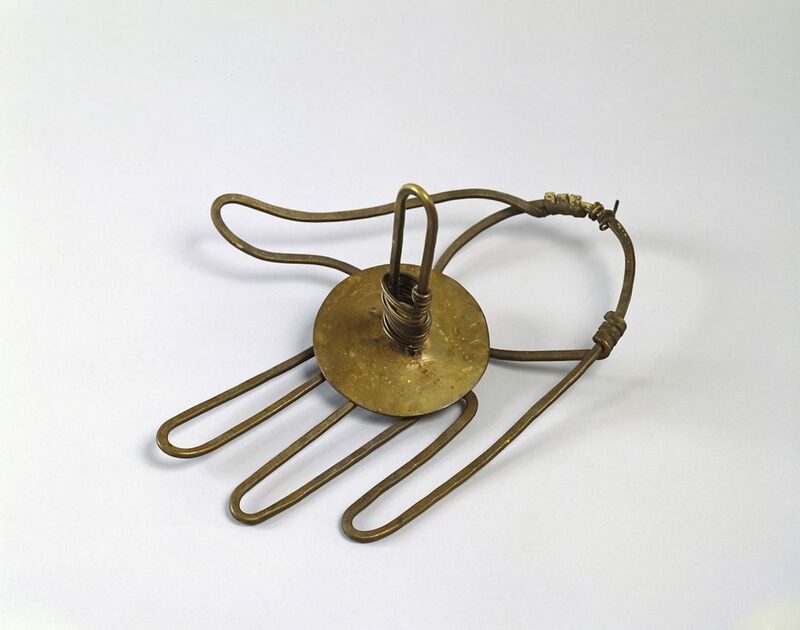 A small toaster that Calder fashioned in 1942 that can grill a slice of bread while keeping others warm underscores how the visionary artist was always inventing. An archival image of the Calder farmhouse kitchen reveals a Corn Flakes box amidst a countertop full of handmade utensils. Vanagan notes that cereal boxes used to come sheathed in plastic, leaving their contents to grow stale quickly after they were unwrapped. 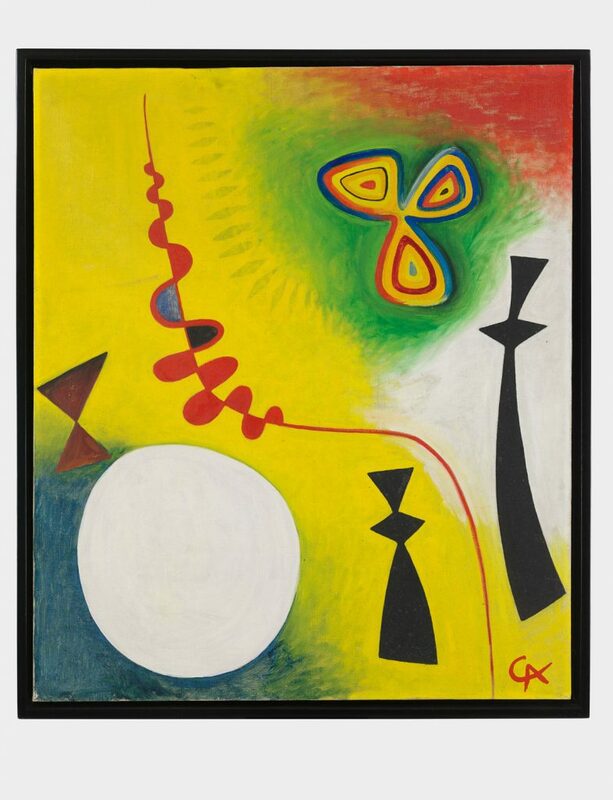 That is until Calder allegedly wrote a letter to Kellogg’s suggesting they package the product in plastic first before boxing it up. 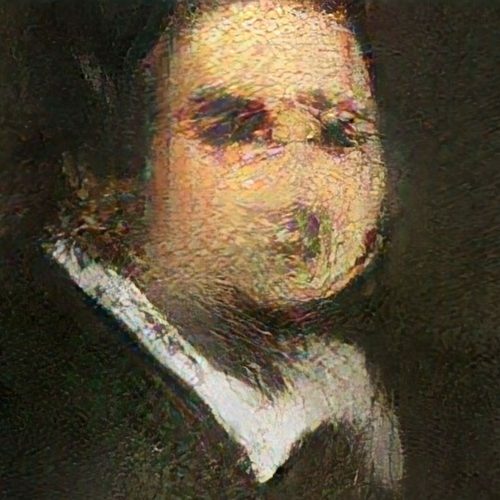 “It’s amazing to think that we have one of the foremost artists of the 20th century to thank for crisper breakfast cereal,” she quips. 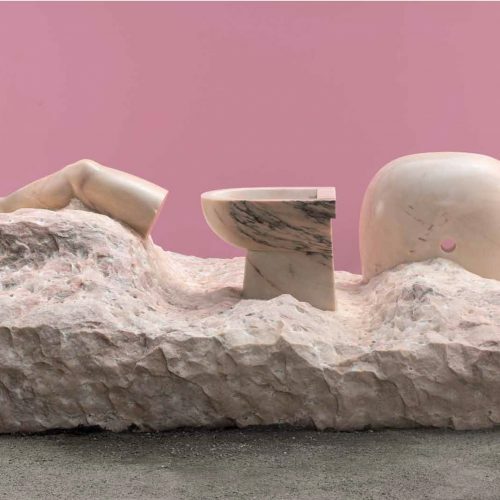 “From the Stony River to the Sky” is on view through September 9 at Hauser & Wirth Somserset.